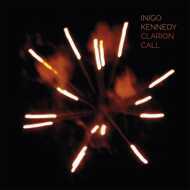 Inigo Kennedy is back on Token and following up last year's tremendous album, Vaudeville. Beginning with the sombre and emotive "Clarion Call" with beautifully haunting melody above epic strings and a steady beat, this is the perfect transition track or closer for any techno DJ's set. "The Fold" works some epic and cinematic pads over some futuristic sound design, but just wait until that entrancing bassline sets in. On the flip "Keplar" is a broken and soulful number that's not quite electro, not exactly techno, but definitely brilliant. With yet more of those amazing strings in the mix. Finally "Dusk" is probably the most straight ahead track on here, but like the rest it's rather restrained, in the best of ways. A booming 808 kick gives momentum beneath a haunting cello and warped chimes that morph into something else. After nearly 20 years in the game, Kennedy still manages to impress. Tremendous work.